Does seeing a dyspneic cat make you tachypneic? Not sure what to do, what drugs to reach for, or how to do a thoracocentesis? In this VETgirl Real-Life-Rounds, Dr. Justine Lee, DACVECC, DABT will review the evaluation, diagnosis, and treatment of the dyspneic feline patient in this case-based rounds. Ultimately, the VETgirl team wants you to be confident when critically ill cases come running through the door. 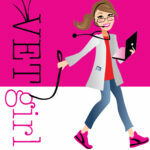 VETgirl understands that ivory tower medicine is not available to most, and not necessary for many. We practice real-life medicine. We offer no heroic proclamations, drama, or even a fancy PowerPoint with animation. Practicing real life medicine is tough and we understand that we are all in the trenches together. For VETgirl ELITE members only, we present Real-Life Rounds, an interactive session where VETgirl ELITE members will have the opportunity to interact with specialists during an informal 30-minute session on specific topics. No problem – will email it to you now! Hi. Just like Andrea, I’m not finding the register button. Can you send by mail?